LKY was so impressed with him and like other global cities we bought his ideas and now we are paying for it. He was also partly responsible for turning LKY gay friendly because the data seemed to suggest that wherever the gays congregate the place is more creative. Now Dr Florida after observing his ideas put into practice across so many leading cities have concluded that he was wrong. Today we are all paying a hefty price for that mistake. Now our public libraries do not even bother to carry his latest book. The Chinese used to look to us to learn as much as possible to bootstrap their development. Increasingly the roles are being reversed as in more and more sectors we will be learning from them. 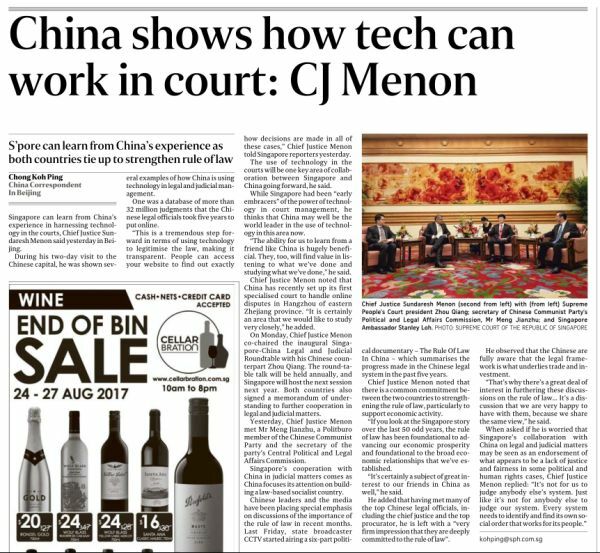 It has now gone to the using technology in the courts. We were an early innovator in this game but the Chinese have clearly sped ahead of us. I once told my ex boss that in business and employment, the most difficult moment for us is when the Chinese are catching up and overtaking us. It will get easier when they are ahead of us. Globally this is clearest when the developed world were the customers for the Chinese but it is now shifted very much to the Chinese being the customers instead. Fortunately not all economic sectors suffer this transition at the same time or the strain may be too hard to bear. But it is coming, one by one and like it or not, all of us in Asia would become economic vassals to China. Then the Chinese will use their economic might to bolster its military and extend their security umbrella over Asia challenging the Americans inch by inch with the Indians, Japanese and Aussies among the last to fall in line. This is not the foregone scenario though, the future reality will also depend on how the Japanese, Indians and Americans react to China's obvious strategy. We do not need to care about these big powers except how they might price the external environment which we must make a living out of. The issue is can we pay the Chinese price? Everything falls into the place after that. If you cannot make enough sense of what is happening, you would say the future is unpredictable and bears watching closely developments. That is the stance of our PM and his ministers. The issue is not its unpredictability but our inability to make enough sense of it. Without having a sufficiently clear idea of what might come, we do not know how to get ready for tomorrow. 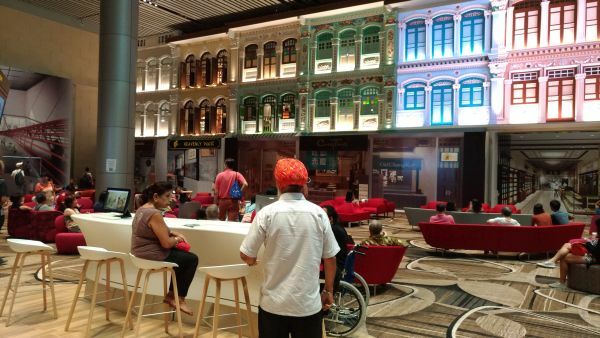 Singapore performance as a society and economy is going to suffer. We have done quite well but I am not sure if we know how to continue doing so. How do you know what to pack for the trip when you do not know where you are going? Meanwhile a party which place its interests ahead of the nation will prevent the next LKY if we have one at all from emerging. As always good is the enemy of the great. A friend's daughter died from this slightly more than a year ago. She was barely 22 years old. This threat has appeared on the scene stealthily, and it is probably not unique to America which the story is based on. A month before the Israelis have reported similar findings among its youths. Perhaps we are well on the way to knowing what the data for us is like. I hope I am wrong but would not be surprised if the trend here is similar to the Americans and Israelis, rich societies with somewhat similar lifestyles. This is not Science yet but eat and run about like your parents when they were young and it might helped reduced your risk. 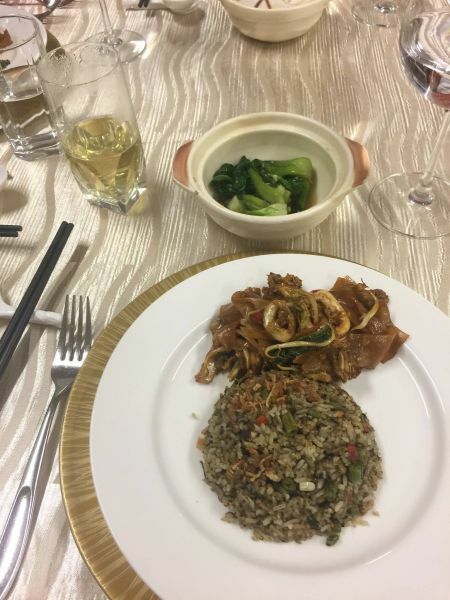 That was the PM's dinner before he delivered his NDR 2017 speech in English. You get some idea of what eating healthily looks like especially the staple: brown rice. Many will say this is taking out all of the fun in life. They would say living a shorter and pleasurable life is better than a long and boring one. 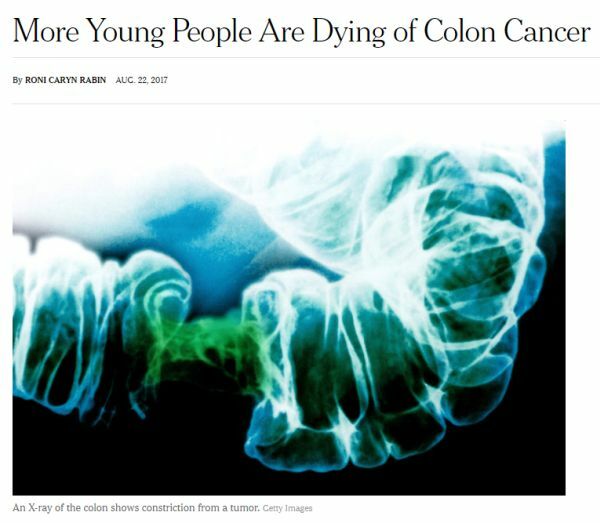 Of course the idea isn't between shorter and fun versus longer and boring, it is the on average eight years of poor health before death, much of it related to diabetes that is the problem. The PM spoke on three issues this year: pre-school education, diabetes and smart city. Seemingly smart things with big impact down the road. Nothing mentioned on our external environment which suggests to me that he has finally taken Kishore Mahbubani advice that he is not LKY. We do need our leader to share with us what he thought of the region and the larger world because we are totally dependent on what is outside for our security and livelihood. Unfortunately he cannot do it safely or with sagacity. Remember we are price takers. We can make all the plans we want but as always it will be what happens outside Singapore which will finally decide the choices available to us. We badly need someone who can climb up the tall mast and look ahead. Every year the old map bequeathed to us by LKY gets more outdated. 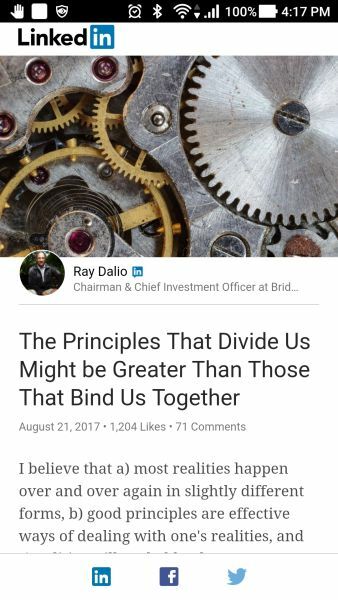 These are extraordinarily abnormal times and even the taciturn Ray Dalio had chosen to share his views publicly on this issue. At home our PM had kept mum and since then I have told friends this year NDR speech was the worst ever. History has shown that democracies are healthy when the principles that bind people are stronger than those that divide them, when the rule of law governs disputes, and when compromises are made for the good of the whole—and that democracies are threatened when the principles that divide people are more strongly held than those that bind them and when divided people are more inclined to fight than work to resolve their differences. Conflicts have now intensified to the point that fighting to the death is probably more likely than reconciliation. I don't believe our PM is ignoring the elephant in the room. I think he does not have the confidence to talk about it publicly. Earlier this morning I came across this by Bilahari Kausikan. What is the difference between a terrorist and a freedom fighter? They could be the same person depending on which side you are looking from. So is the reserved presidential elections system a unique stabilizer? Not to me but I am open minded enough to understand there are other ways to look at this. I just happen not to agree with them. A reserved elections make minorities look like losers i.e., they can't compete on their on merit and need help. This brings us closer in thought and spirit with Malaysia's pro-Bumis policies than one based on meritocracy. 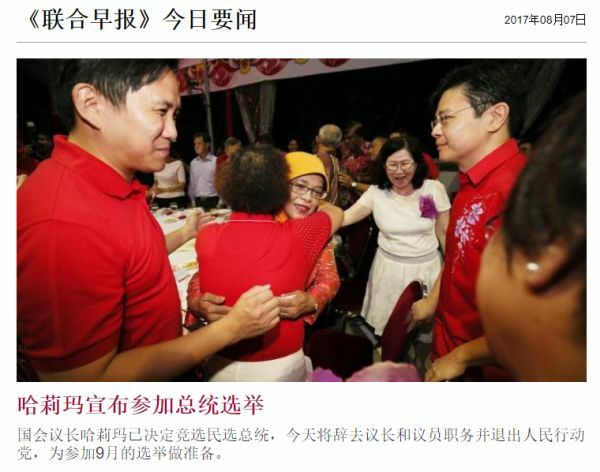 I am for giving more help to the Malay community to achieve but not for lowering the bar for them. The community will lose self respect. They are not suffering like in a game of reading, handicapped by dyslexia. Even my daughter worked to overcome her dyslexia over time and she competed as equals with her course mates by the time she got to university. If I thought like the PAP government then I would have asked NUS to give her more time for her exams. Bad idea. Instead we worked hard to overcome her handicap. Never give up. With such a loser attitude encouraged by the government, the Malay community will fall further behind. I do not wish for the Malays to spoil their votes in the upcoming presidential elections reserved for them, but I would understand why if they do. For their own self respect. The Malays are as Singaporeans as the Chinese. If this is not true then we will find convenient reasons for all sorts of discrimination e.g., against women, older workers etc., In fact we are already doing all these as hypocrites. Now the hypocrisy is enshrined in the highest public office. We are not foolish enough to fast track ourselves to hell but not wise enough to avoid the slow long road to perdition. My daughter was telling me about this amusing incident in Germany she caught off Huff Post. I saw a version of it this morning from the NYT. Non-violence with faith and patience works. It is not natural because it is spiritual. I recall from the 80s a remarked made in the movie Gandhi played by Ben Kingsley, "An eye for an eye, makes the whole world blind" The Christians were learning their own teachings from a non-believer. God is "promiscuous" and surprising because Jesus Christ is the only way to him. This reminds me of the importance and effectiveness of the spiritual disciplines, many of them from even before the Roman Catholic church which was passed down through millennial. 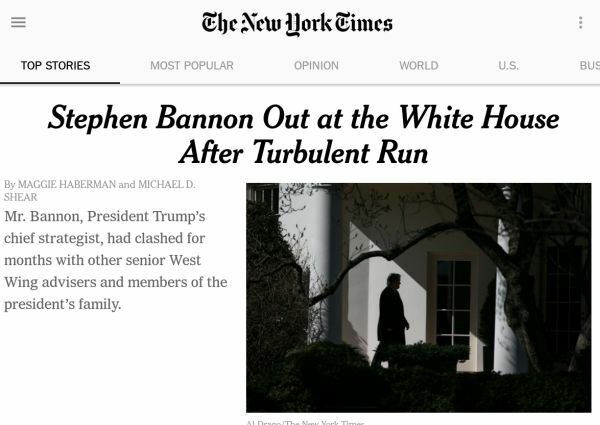 Woke up to the news that Steve Bannon has been fired. This is wonderful news. He will do what he wants to do but the White House is not the place for them. When is Trump going to resign? I would think he would prefer that than get impeached and kicked out. Deja Vu for me. I remember day after day as a young executive looking at those people at least 20 years older than me back then. They lived such comfortable lives working out of those rooms and we secretaries to do their chores. If only their boss, the VP wouldn't so demanding they would have succeeded at creating heaven on earth. I am still in touch with this VP who has long retired from the company but none of these self centered managers. I recognize how at personal or atomic level it could be aggregated into findings in this ST story despite the many years of separation. All the opportunities I had to try new things and learn were mostly driven by this VP but what can one person in a large division do? In the end all of us left for other employers only to discover that by and large we are ruled by happy golf playing bosses who work out of rooms and resist change, only interested in the sweet spot they have navigated themselves into. It is a different world now. Most of those rooms have been torn down but that basic bo-chap attitude find every opportunity to surface. The only exception was the time I was at a leading Wall Street bank when people like that inevitably got shown the door, where bad luck was also your fault but the bonuses if you can survive was really good and embarrassing if you perform. 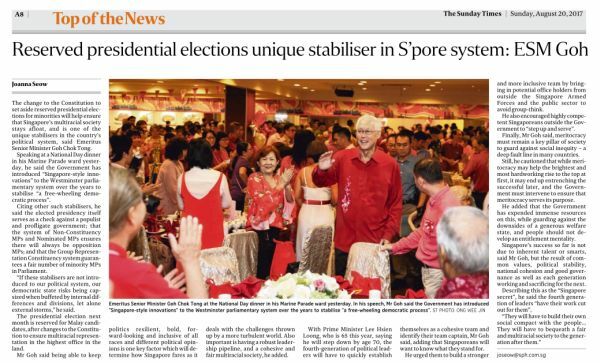 Standards has been falling at ST and also the SCMP. I was surprised at the writing in this article. Midway I detoured to check who wrote this. It was one of our own veteran journalists, Zuraidah Ibrahim. Her other half is Cherian George, a good writer and incisive thinker. We lost both of them to Hong Kong. To me this was the most important sentence in the story. "maturation process" in SG-China relationship. Ms Ibrahim provided the context for our expulsion of Huang Jing by reminding us of our the expulsion of the first secretary of the US embassy here way back in 1988. Fast forward our relationship with the US strengthened. Ditto what will follow from our action against Huang Jing. In private, Singapore is steering a different direction, not a complete change of course but just as in leaning in more toward the US before, we will be building our relationship with the Chinese more rapidly like we had with the US now. In other words the environment changed, we adapt. Whoever drove the change we ride with the driver. Post Cold War it was the US, now it is China. This just a game of best friends and better best friends. The focus is on "best" rather than "better". 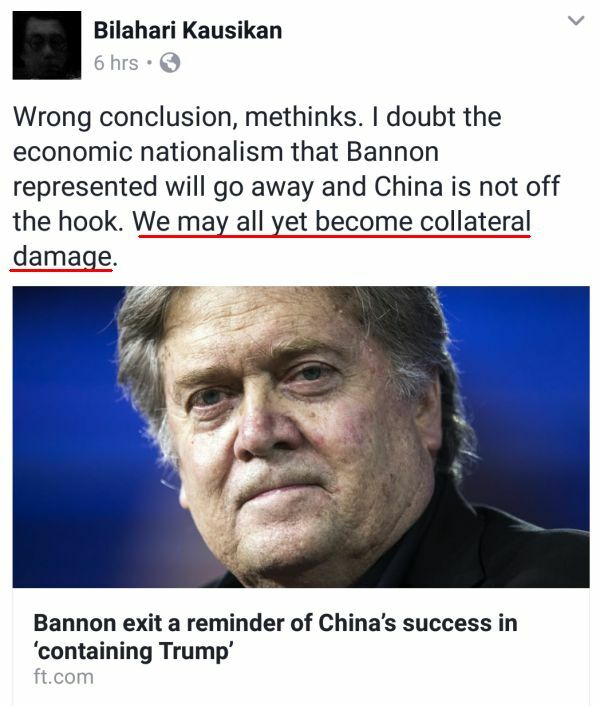 Whoever makes more sense and earned the "better" that country now is China. It does not mean that our relationship with America will weaken but it does mean there is more growth between us and China vis a vis the Americans. The ball is in America's court when it becomes post Trump to catch up or lose out. I received many copies of this via Whatsapp with some providing more intriguing pictures. This one is the most detailed and "convincing". Only two of them follow up with messages that the news was fake. The fake news problem is getting more serious but this is also the moment to get familiar with them and learn to spot them. Some of us are conscientious students but most are either lazy or stupid, swallowing hook, line and sinker. My worry is that as part of the natural sorting process, the shrewd and the suckers are organized into separate groups. We will have to depend on common members of both groups to keep pointing out such hoaxes to the lazy gullible ones. I have noticed some are just too lazy to learn, always leaning on others to look out for them. To add insult to injury, quite a few even enjoy fake news because they are often juicy and conspiratorial. I have also noticed agnostics and atheists seem to do better. Took quite a few photos at the Terminal 4 open house yesterday and reproducing by favourite three here. 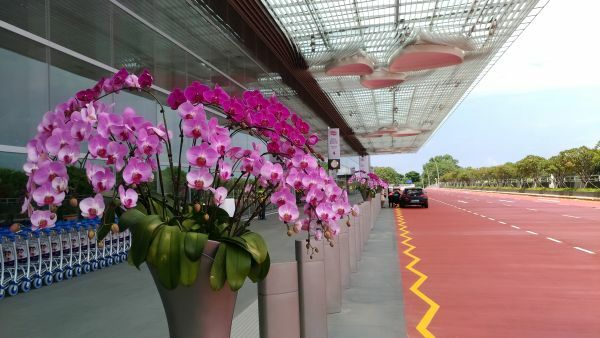 Beautiful ornamental orchids line the whole length of the departure hall. 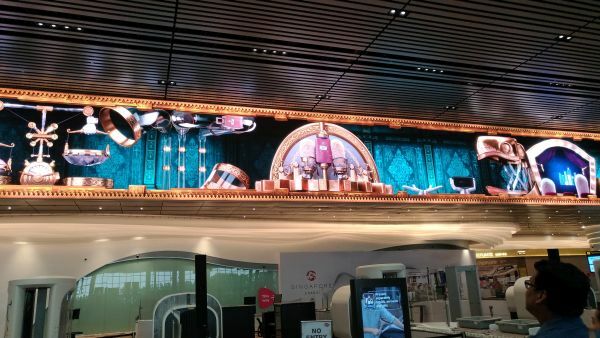 This is not just a picture, it is fully animated between three shows but this one showing how luggage overly creatively handled was wifey's favourite. Good for distracting restless people as they wait for their turn to have their travel credentials and security checked. The the picture before part of this wall is animated as well. It presented a show of romance between a Peranakan young man and woman who were neighbors. The show ends when the couple got married. 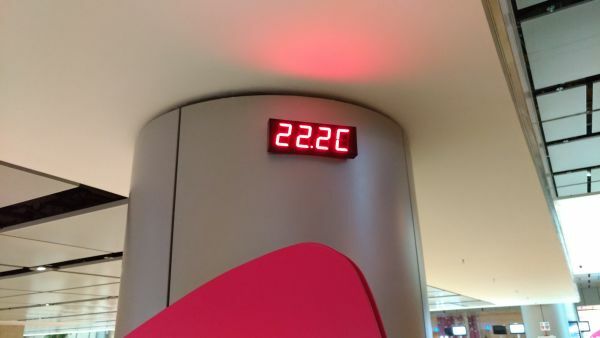 And I just have to add that the temperature was a slightly chilly 22.2C but give me this anytime over the hot weather outside. All in it was quite fun. If this is a reserved for Malays only presidential elections, I am not voting for Halimah. I have nothing against her, in fact I like her. It is the PAP that I have a problem with. So if the high court would to rule that only the next PE is a reserved one, I might vote for her. This is not our MRT but the standard setting HK MTR. I was keen to study the difference between them and us during such an event. I don't track such things closely enough to compare the potential penalties they face vis a vis our MRT in an incident like this. What is noteworthy though is that they have a much clearer idea of what went wrong. For us, we would simply have said, "signaling fault". With them they explained how three computers controlling the signaling to ensure the tracks are safe had experienced an unprecedented failure, which had not happened in well over ten years. In other words they know their system much better than we know ours. For us, we cannot even anticipate a sliding door coming off its rollers and intermittently tripping the power. Looks like we have a near impossible problem and the solution is to replace many bits of the system gradually until we know the behavior and health of each bit. This will take many years. The government and operators screwed up but never come clean about it and so we also never stopped getting angry with them. 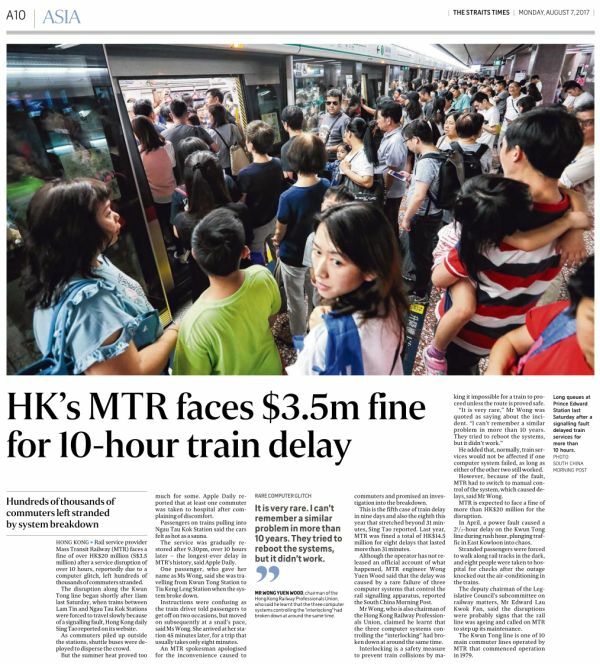 I believe HK commuters would mostly just brushed off this rare delay. Here we would asked for heads to roll but of course to no avail. What for? Rolling heads will not solve our problems. The guys now in charge for fixing our system aren't the ones who created the problems in the first place but they are getting all the brickbats.